Leh, the capitol of Ladakh, is situated in a fertile side valley of the Indus river at an altitude of 3521m. Since the 17th century Leh has been the capital of Ladakh. It is a main centre of administration, trade tourism, transport and so on. All the major hotels, guest-house, restaurants, shopping centres and transport facilities are in Leh, thereby making it and excellent base for touring Ladakh. The best season to visit Leh is from April to November. Located at the heart of Leh, the palace lures tourists from far and wide. The palace stance in its dilapidated yet magnificient form atop the Namgyal hill. It is a nine-storey building build by King Sengge Namgyal in the 17th Century. The interior of the palace is decorated with flaking meurals and motifs. The designs are archetypal of medieval Tibetan-Architecture. An enigmatic stark structure stands right above the palace, the famous Victory Tower. It was built in the memory of the triumphant brave Ladakhi soldiers who fought the invading army of Balti Kashmiris in the 15th Century. The palace now houses the office of the Archaeological Conservation Organisation of the Indian Government. It also has a museum. 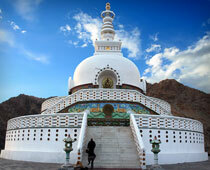 Shanti Stupa, a Buddhist white-domed stupa on a hilltop, is a striking recent sturucture. A Japanese who harbored the aim of spreading Buddhism across the world had it built in 1985 with aid from the Japanese Government. It was built to commemorate 20500 years of Buddhism. At the base a temple holds the relics of Buddha, enshrined by the H.H. The 14th Dalai Lama him self. There is also Japanese Pagoda where one can meditate peace fully. 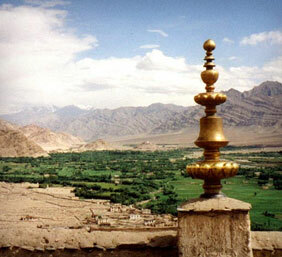 One can enjoy a spectacular view of the surrounding landscape from the stupa. Overall the Shant-Stupa is a time-capsule in which Buddha’s relics, Holy Darma books and Buddha’s Statues are sealed for the future generation. It is a Sympol of Peace, Unity and Buddhist teaching. The stupa is very attractive with the sides are decorated with gilt panels showing the life stories of Great Buddha. The Stupa is accessible by trekking, jeeps or taxis. 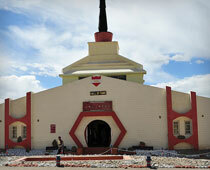 Set on the Leh-Kargil road, around 23 km from Leh, Pathar Sahib Gurdwara invites many tourists and pilgrims. Built in 1517, it serves an evidence of Guru Nanak’s visit to the Ladakh. Legend believed that Guru Nanak, during his journey to Ladakh was attacked by a wicked demon when meditating by pushing a huge boulder from the hilltop. But the boulder upon touching Guruji’s body became softened like warm wax. Failed to harm Guru Nanak, the demon realized his mistakes and asked for forgiveness. The demon also promised to serve people and lead a life of a noble person. 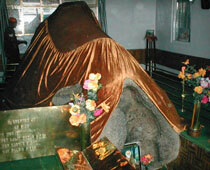 Since then, the rock is preserved and worshipped by the local residents and they called Guruji as Nanak Lama. During 1965 road construction, Indian Army failed to remove the rock and hearing the story of Nanak Lama, built the Gurdwara and is still maintained by them. This glorious museum is located on the Spituk-Kargil road, approximately 4 km from Leh city. 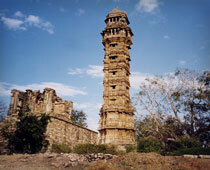 It was built in memory of the brave soldiers who lost their lives in Indo-Pakistan war. Maintained by the Indian Army, the museum showcases seized arms and amenities of Pakistani Army, pictures and biographies of brave soldiers. A section of the museum also displays Siachen area exhibiting apparel and amenities used by the Indian Army in the region. Apart from this, one can also witness items related to Ladakhi culture, history, vegetation and wildlife found across the globe. Stok Palace Museum, located within the Stok Palace at a distance of 14 km from Leh is the palace museum of Royal family. The museum showcases the worthy royal artifacts and paraphernalia including royal crowns, precious heirlooms, copper coins, prayer instruments and materials, precious stones and jewellers and also many very old 16th century Thangkas, which represents the life and teachings of Buddha. Accessible easily by jeeps or shared taxis, it is a nice museum to view the Buddhist remains in India and also to come across Buddhist life style and culture. A high mountain pass, 49 km from Leh, the highest motorable road in the world at an altitude of 5379m. It is not very often that one gets to drive on a road at an altitude of 18,380 feet. That is where Khardungla Pass, meaning the ‘Pass of Lower Castle,’ is located on the way from Leh to the Nubra Valley in Ladakh. It is the highest motorable road in the world.